The WINNER of Best Telecom Site at the Web Awards! 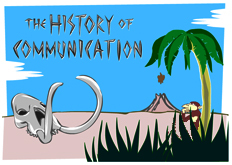 interactive depiction of the origins of telecommunication from Cavemen to the present day in eye-pleasing low-fidelity! 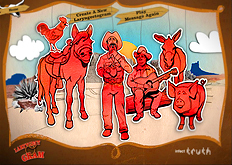 Singing Cowpoke - American Legacy Foundation's Truth campaign - An AWARD WINNING part of the Truth campaign. Created all character animation. Give it a whirl! 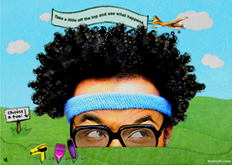 Derricks 'Fro - American Legacy Foundation's Truth campaign - Part of Truth's youth smoking prevention effort, this animated collage is live at thetruth.com/games. Or play with Derrick's hair right here! An in-house presentation for a product relaunch. 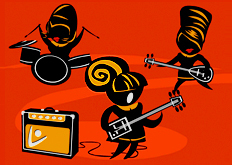 Receiving only an outline and the sound tracks, I created all the graphics and animation on an extremely tight deadline. 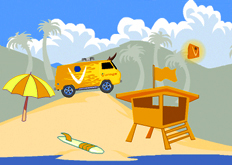 Recently discontinued, this was a online game where you drive a Hot Rod Van and throw products to customers. Relaunch coming!